Want to leave the grocery store with healthy options for your family, instead of tossing a ton of junk food in your cart? Are you ready to get in and out without feeling like you’re spending an eternity in the aisles? If you want to make simple steps toward making better food choices at the grocery store, it’s important to have a plan in place before you grab your cart. Download the Ubiquinol “Healthier Grocery List” now! Yes, a list! Consider it your roadmap, or GPS, through the grocery store aisles. Stick to the list and the list won’t let you down. Another tip is to not go shopping on an empty stomach. You might typically make healthy food choices, but if you’re hungry, everything and anything could end up in your cart. Write down everything you need for all of the recipes you’re planning to make. Then mark through the items you already have in your pantry. Add any toiletries, pharmacy or other miscellaneous items, and voila — you have your grocery list. We’ve got some great heart healthy recipe ideas for you! Save yourself time (and steps) by grouping your list by category. Or take it a step further, and group it by aisle (check your store’s website or app to see if a map or aisle layout is available to reference). If you know where you’re going in the grocery store, you likely won’t get lost and forget about your list altogether. BONUS: Grouping your list can also help you skip the candy or ice cream aisle! When faced with so many options on the grocery shelf, laways choose healthy. That means looking for sugar-free, low sodium, or fat-free on the labels. Look for the words “whole wheat” or “whole wheat flour” on the nutritional label. Choose whole grain breads with at least 3 grams of fiber. Shoot for less than 100 calories per slice or serving. Choose lean cuts of red meat. This means lowest fat percentage or least marbling. Opt for ground chicken or turkey instead of beef in some recipes to lower the fat content. Choose brown rice and whole wheat pasta for a healthier option. See if you can replace your entree’s pasta with veggie options like zucchini or sweet potato noodles. Cauliflower rice has been a popular substitute as well. Watch for sodium and sugar in sauces and condiments. Most have low or free options. Don’t forget the fat! Look for low fat or fat-free alternatives. Just like in the bakery, look for whole-grain or multigrain products. Go for the high fiber, low sugar options when choosing cereal bars and other breakfast foods. Berries and dried fruit can be used to add sweetness to cereal if needed. Cans are another trouble spot for salt. Try low sodium products where possible. For canned fruits, look for the label to say packed in juice instead of syrup. Don’t shy away from the frozen veggies. As long as there’s no added sugar or salt, they can be a great part of a healthy meal. Non-fat and low-fat are the key words in this category. Buy plain yogurt flavor it yourself with honey and fresh fruit to reduce the sugar and calories. Switch from whole milk to skim milk where possible. Or choose 1% or 2% if you can’t go all the way to skim. This is another category to look for whole gram or multigrain where possible. Snacks like almonds, cashews and walnuts are healthier munchies.You can also buy them in bulk and create your own snack bags and mixes. Seeds aren’t just for growing, they’re for snacking! Grab a handful of sunflower or sesame seeds instead of a cookie. Craving chocolate? Go dark for less sugar. Color is key and variety is the spice of life. So look for a large variety of color in your fruit and vegetable choices. Green, yellow, orange - eat the rainbow. Stick with in season fruits and veggies for the most nutrition and flavor. You’ll also save money! Short on time? Buy your veggies pre-cut, ready to go in that recipe. Take the next step and get your produce at a local farmer’s market. 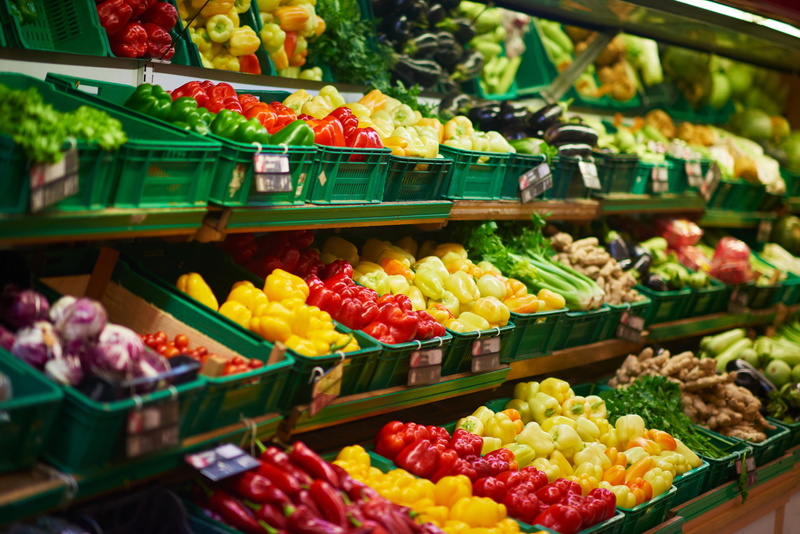 You’ll know your groceries are fresh and you’ll be supporting your local economy. Check your juice and make sure it says 100% juice. No juice drinks in a healthy grocery cart. Stick with the healthiest drink of all… water! Use fresh fruits or fruit juices to add flavor to sparkling or still water.